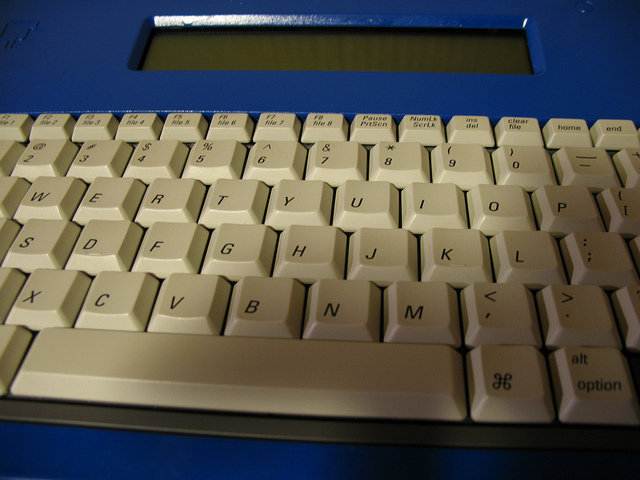 The word-processing keyboard was designed to be just that – a device that would strip away the distractions that had come to accompany writing on a computer – fonts, colors, layout. Instead, says one of the AlphaSmart inventors Ketan Kothari, students should be able to “focus on the words.” So should writers, of course, which goes a long way in explaining why this remains such a beloved product in certain circles. Kothari was, at the time, an engineer at Apple. He along with fellow engineer Joe Barrus had heard the demands of educators who would visit Cupertino: desktop publishing on Macs meant that students were spending a lot of time on, well, publishing and not on the writing process itself. So Barrus built a prototype of a portable word-processor that would enable more focus on that. Kothari posted the idea onto an ed-tech discussion board on FidoNet and got an immediate response from teachers in Seattle. The two traveled to Seattle to demo the keyboard to a small group. The feedback: it would need to be smaller, it would need to be battery-operated, and the 10-key Barrus had initially included was unnecessary. One of the teachers at the demo suggested that the two hold a workshop at the upcoming NCCE (Northwest Council for Computer Education) conference and pitch their idea to more local ed-tech enthusiasts. They did; it was standing room only, and teachers were ready to buy, pulling out their personal checkbooks to do so, Kothari jokes. But first, Barrus and Kothari had to move from prototype to production. And they had to figure out what rights, if any, their employer Apple was going to claim to the idea. Unlike today’s education technology startups that rush to obtain venture capital at the first inkling of an idea, AlphaSmart was largely bootstrapped. (The company’s original name was Intelligent Peripheral Devices.) The team tried, but failed, to obtain an SBA loan. They pooled all their savings, kept their day jobs, and recruited Ketan Kothari’s brother, Manish, to head up marketing efforts, working out of Ketan’s spare bedroom – one of ed-tech’s few “garage” origin stories. After several points when the company almost folded due to financial and production issues, AlphaSmart started shipping in the fall of 1993. It couldn’t build a lot of inventory simply because it had little capital. However the devices were in high demand, and within six months, AlphaSmart found itself cash-flow positive (again, unlike today’s education technology startups, even if they’ve raised venture capital). With their connections to Apple and its education distributors and resellers, AlphaSmart’s founders had access to several key inroads into schools. But the company decided to build direct sales channels. That gave them a closer relationship to customers, they said. So AlphaSmart decided to use its limited marketing dollars to focus on trade-shows, which enabled them to cut out the middle-man and, of course, helped them get feedback directly from teachers, both new and existing customers alike. That difference is exemplified by the “low-end laptops” that a few desktop computer manufacturers had begun to offer. In the team’s view, these products were still not addressing the teachers’ needs well. The laptops sold in the $300 to $500 range, but they did not feature full-size keyboards, adequate durability, or suitable battery life. Additionally, they were complicated to deploy. One low-end laptop, the Tandy WP–2, had a manual that was 150 pages long, whereas the AlphaSmart manual was only 11 pages. Using such devices required downloading and configuring software, which often caused compatibility issues. They required drivers and configuration of the serial port’s baud rate and other settings. They also included extra software, such as a terminal emulator and calendar that was a distraction. “In our minds, low-end laptops were clearly way too complicated,” Ketan said. Personal computers were not only seen as too complex (and more than a little intimidating) to teachers; they were expensive. The early AlphaSmart devices sold for about $270 – cheaper than either laptop or desktop computers, which ostensibly meant that classrooms could distribute one per student. They were also quite rugged, with a lengthy battery life (the importance of which cannot be overstated in schools) and no internal moving parts, something that Barrus would demonstrate – pretty memorably for anyone that ever saw AlphaSmart in a tradeshow – by dropkicking a keyboard. Although AlphaSmart had successfully found a niche selling its simple, smart keyboard to elementary school teachers, it soon began to explore other markets. In 2002, for example, it released the “Dana,” a higher-end product that functioned much more like a lower-end laptop. The Dana ran the Palm OS mobile operating system, had 8 MB of memory and a touchscreen, and was not only WiFi enabled but had infrared “beaming” capabilities to move your text from the AlphaSmart to another PC. The Dana’s battery life suffered with these advancements – the device only 25 hours worth of life. It retailed for about $400 or more. And that meant that it was beyond the budget of many schools. In addition to feeling pressured to produce devices that met new demands for mobile computing, AlphaSmart also heard from teachers that the smart keyboards should offer more writing and editing curriculum. In other words, there were pressures on the AlphaSmart to become more complex and more robust in terms of hardware and software. The company had its IPO in 2004, raising $24 million with a market cap of about $90 million; and a little over a year later, it was acquired by Renaissance Learning for $57 million (which itself was bought by a private equity firm last year). 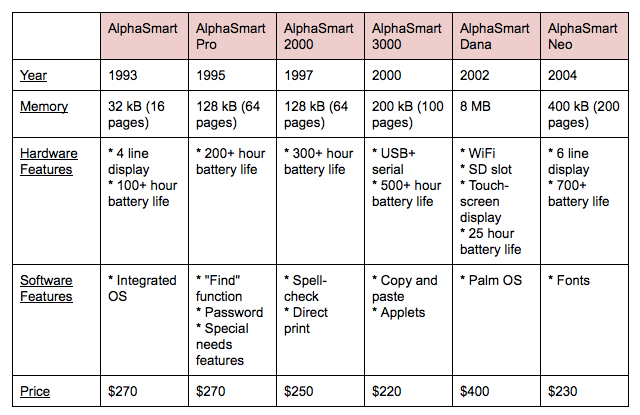 In 2013, the AlphaSmart product line was discontinued. Ketan and Manish Kothari continue to work in education technology; their startup Root–1 was acquired by Edmodo in 2013. Disruptive Innovation: The Wrong Lesson? When a large set of consumers becomes over-served by existing products, the door is opened for disruptive products to enter the market and serve those consumers better. Such a disruptive product is more likely to be successful at capturing the market if it is focused on a specific job those consumers need to get done. This focus allows development of a product that has the right performance metrics at the right cost, and it allows the producer to target the right customer base with a clear message. The founders of AlphaSmart, Inc. created one such product and followed several key tenets of disruptive innovation in the process. Their product targeted customers trying to do a specific job, but for whom a simple, inexpensive solution was unattainable. With this “disruptive innovation” analysis in mind, it is probably worth considering here how the end of the AlphaSmart product line coincided with the introduction of the Google Chromebook – another low-end, low-cost, low-functionality device that has also taken the education market by storm and which is, let’s be honest, little more than a “smart keyboard” centered on the Google Apps productivity suite. But there’s more to the story of ed-tech adoption here than how AlphaSmart fits into some business school model about how entrants on the low-end of the market come to displace those on the high-end. Indeed, this highlights the flaws of looking at education technology simply through the lens of “the market.” Remember: neither the AlphaSmart nor the Chromebook can even remotely replace a laptop – no, not even for elementary school students. Choosing a “smart keyboard” (or tablet) over a laptop means choosing a device with less functionality; and in turn, students will be able to do less. It’s a trade-off that education seems to have readily made: efforts to give every student a computer – Seymour Papert’s vision for powerful machines enabling powerful learning – are reduced to giving every student a word-processing (or increasingly these days, online standardized testing) gadget. That is to say, machines are not “disruptive innovations” in schools; rather schools often simply look to replicate traditional practices with these new devices. 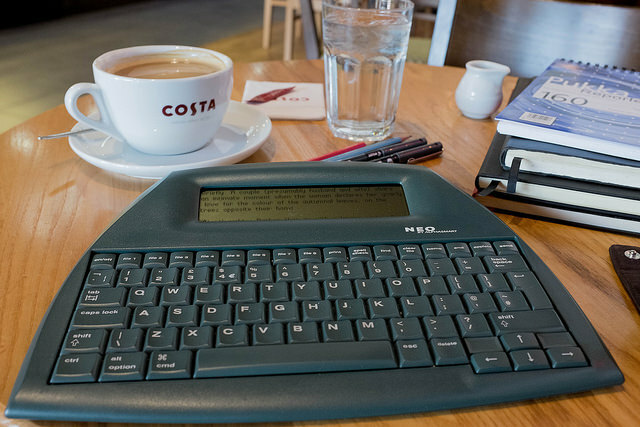 Thus, “writing” becomes simply “word processing” – the processing of words via machine rather than paper and pencil – and perhaps as such, the appeal of the AlphaSmart smart keyboard becomes pretty clear. Yet the ongoing appeal of the keyboard to writers reveals something else about technology writ large. There is this tendency, thanks to “markets” of course, for constantly upgraded iterations of increasingly overly complicated tools that never succeed in meeting users' needs (because as Steve Jobs famously said, why bother to ask). And all that make writing – already a painful and challenging process – even harder to actually accomplish. The elementary school teachers that inspired AlphaSmart were right: writing isn’t editing, and writing isn’t publishing. Writing is writing, and the computer - particularly one connected to the Internet – can be a quite lousy machine for aiding that.